Tuleburg Press welcomes Leanne Grabel. She is an author, illustrator, performance poet, and semi-retired special education teacher. She co-founded Portland’s poetry fount of the 90s, Café Lena. Grabel is known as a performance poet; she is not afraid to get vibrant and emotional when performing a reading of her work. Her reading of Gold Shoes aims to be an immersive and performative experience. 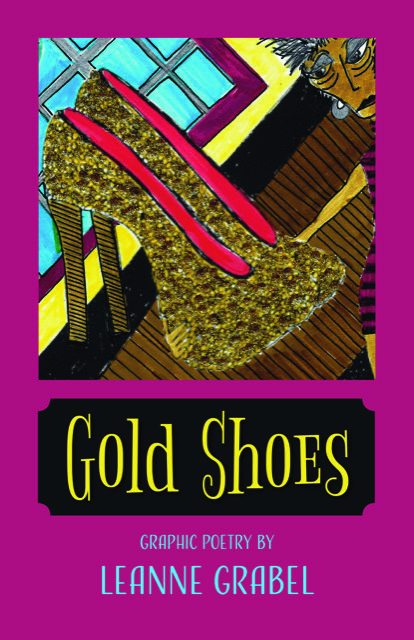 Gold Shoes is an illustrated collection of graphic prose poetry. Grabel intended for the collection to be a tribute to her late mother. The poems play with shape, color, and punctuation to create a unique rhythm that Grabel describes as, “a justified rectangle on the page”. Tuleburg Press will be hosting Grabel at its facility The Write Place. The event will be free to attend with Grable’s book available for sale at $21.99. The event will take place on May 9th, 7:30-9pm at The Write Place 343 E Main Street Stockton CA. For more information about the event and the author visit leannegrabel.com, and tuleburgpress.com.